It has been argued that one can only recognize the self through the “other”. This is because the “other” confirms what the self is not. This argument is one which is salient when people promote “colour blindness” as a solution when it comes to racial prejudice. Those who are in favour of the understanding of the self through the “other” bash the notion of colour blindness because of the perceived inevitability involved in self identity formation of identifying the other and participating in “othering”. Some collectivist societies openly recognize that the notion of the self is one that cannot exist independently without the other. There are languages that do not have an equivalent word for “the self.” The pronoun “I” is often the closest word to the self. In South Africa where I am from, the philosophy of ubuntu summarizes how the self cannot endure independently from others. Ubuntu is the belief that you are who you are because of your interactions with those around you who also contribute to your development. Here, the definition of the self is dependent upon the recognition of constant interaction with the other. In order for Auroville to keep evolving, individuals would need to continue to learn and share from each other. The NGO that I am working with is called Auroville Village Action Group (AVAG). The organization has self-help group sessions for its members who reside in the local villages. This may seem a little contradictory in some ways right? A self-help group in a community that doesn’t fully recognize the self without considering its community and “others”. Self-help is a process embedded within psychology. The field of mainstream psychology often promotes the self through wholly focusing on the individual and personal development. How then does personal development resonate within a society that prioritizes the need for the development of the self through others? AVAG has managed to integrate this within its organizational practices. AVAG’s self-help groups reflect the NGO’s ability to incorporate the concept of the self in a relevant, contextual manner. This could also be an indicator of perhaps why the self-help groups have been sustainable. Anbu Sironmani is the Director of AVAG. She argues that AVAG combines the self within its collectivist context by putting emphasis on the fact that individual development is a precursor to the sustainable development of the community. 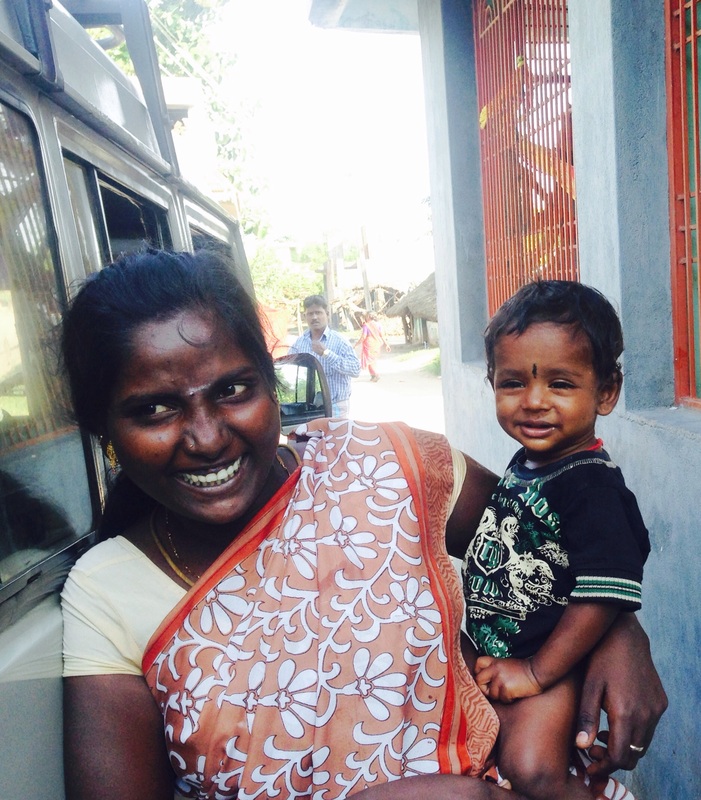 Anbu mentioned that since the self-help groups have started, the suicide rates have dropped significantly within the villages. AVAG’s model for its members recognizes that multiple factors contribute to the self reaching its highest potential. AVAG’s services include: self-help groups, education, microcredit, community service, social enterprise and community development. The sustainable development of the community is the utopian ideal for AVAG. It is the reason behind why I, as a self that is not mutually exclusive from my colleagues, have come to learn from this community. I cannot help my self but be inspired by the work of AVAG and its members. A Utopia of Networked NGOs: Is it Scalable? As an intentional community located in Tamil Nadu on the Bay of Bengal, Auroville is a place to experiment and bring forth innovative ideas working towards all aspects of sustainable development. Aside from the beliefs and values held within the Auroville Charter, it is also a microscopic model of how communities can operate collaboratively to achieve many of the sustainable development goals as outlined by the United Nations. The priorities and values of Aurovillians is admirable and desirable in my view as someone from a Western upbringing striving to work in International Development, however is this microscopic laboratory a replicable model throughout India and other communities in the Global South? After visiting about thirty non-profit organizations in and around Auroville over the span of seven days, we have been exposed to a broad array of inspirational projects that are working towards one or many of the sustainable development goals. They ranged from environmental and agricultural sustainability, to social development issues promoting education, equality and empowerment. In Auroville specifically, many of these organizations and the people involved work as an interdependent public to support their overall common goals of sustainability and development. For example, several organizations that utilize recycled or reusable materials and have a zero-waste policy such as Upcycle Studio, Eco Femme and WELL Paper are supporting the primary efforts of the organization WasteLess whose main objective is to raise awareness and education on harmful habits that threaten the environment. 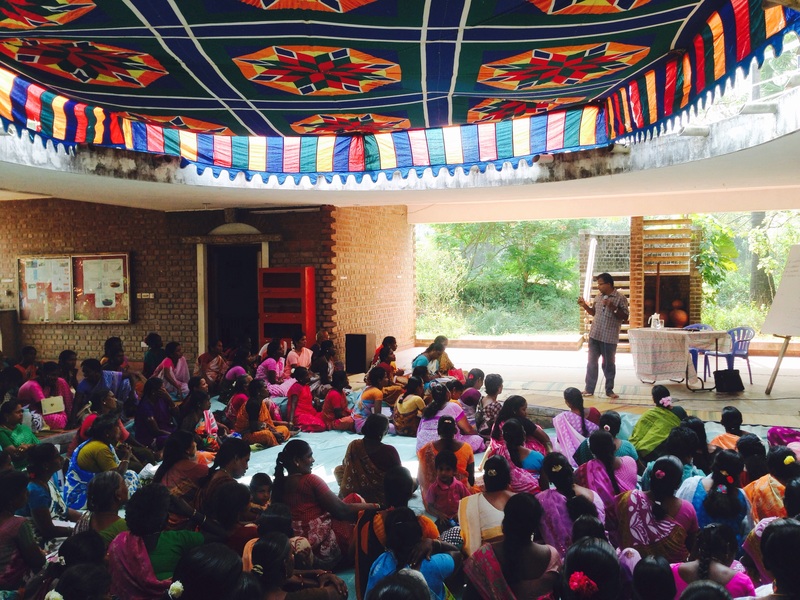 Auroville Village Action Group (AVAG) and WELL Paper are also both working to empower women through skills training and autonomous self help groups, or SHGs. AVAG assists in the selection process for the women who will be trained in creating eco-friendly products for WELL Paper. All of these are Auroville based NGOs, and there are many other instances of visible support and collaboration between the NGOs here. It is clear that the organizations within Auroville support each other’s visions towards a common goal through various projects. However, even between Aurovillian NGOs and NGOs that we visited in Pondycherry, such interdependency and support is not so apparent. Therefore, can this model of networked NGOs who support and promote one another to succeed in their goals be applied in other areas of India and the Global South? Like anything in the field of development, it would need to be adapted for each particular culture and context. And it is likely that this is already the case in some communities, but perhaps not to the extent and concentration of Auroville…at least not to my knowledge. While NGOs around India and globally likely do support one another within their realm of development, this high concentration of sustainability and development in almost every aspect of daily life and business that is visible in Auroville seems out of reach given the international complex systems of government, political views, social issues, and the corporate world…just to name a few. This paradox continues to follow me during my time here in Auroville, however I do remain optimistic as a future professional in the field that progress within NGOs and towards a healthy networked NGO model can be made as long as cultural context is first and foremost in assessing the development needs of any community. Auroville Invites Itself To a Great Challenge! What does it mean to create a sustainable city? The citizens of Auroville attempt to answer this question with the creation of their innovative city in the South of India. This is a place where all the NGOs are invested in certain aspects of sustainability. From micro finance organizations, transgender politics to social entrenepreneurships, Auroville’s entire ecosystem is based on embracing sustainable lifestyles. As newcomers, almost half of our team attempts to better understand the idealistic city by posing a lot of questions as student researchers. We are trying to understand if Auroville truly stands for what it aims to be. What will the future of Auroville look like? Is this type of city, free from independent organized governance, the only alternative way of establishing a democractic society? So far, many of our questions remain unanswered. However, it is hard to deny the power of knowledge and intelligence that are invested in this city. From creating a co-op grocery store, to creating a botanical garden in the land of red soil, and a library that includes a multitude of languages, Auroville puts great effort into achieving its goal. It is certain that Auroville Foundation aims to provide better life standards for those around the Auroville community. Even with the best intentions, it is human nature to bring self serving qualities such as ego and greed. Not surprisingly, when a former worker from the surrounding village wanted to take what he has learned from the community and to open a pottery shop in his village, the situation created tension. In cases like this the community does not feel like a winner. It feels like one contributer less. It is the Foundation, what the Aurovillians rely on. Accordingly, individual attemps that are outside of the organization are not beneficial to community. And, since the Foundation has no juridicial power, Aurovillians try to prevent unwanted situations by using social pressure. Maybe I understand it all wrong. Maybe I am confused. But realizing the power of extraordinary know-how brought to the community by the villagers carries an importance. However, limited funds with great facilities that the Foundation provides for its villager workers, seems to be an another local employment challenge nowadays for Aurovillians to overcome. Today, most of us woke up with a mixture or nerves and excitement. No longer would we spend the day completely together visiting different organizations-this early morning, we were going to pick which organization we would spend the rest of our time in India working with. We sat down on the floor of our meeting room- where in the middle of the room Professor Talcott, in addition to the other organizers Sacha and Tanya, had fanned out pieces of paper each containing one of the NGOs we had visited. There was over twenty-five in all. We then had to go around putting our names on our top two organizations. What is interesting about our group is that we are all coming in with different levels of experience and educational backgrounds. Therefore, as we sat in the room ready to pick one of the amazing organizations to work with, there was some apprehension that went along with the excitement because of the responsibility we were about to partake in, especially among some of us who haven’t had this type of experience before. At the end of our meeting, most of us were able to pick our first or second choice and it was time for our initial meeting with our NGO to go over their needs and come up with a specific project that we would be able to complete within our alloted time. I think that this meeting revved most of us up to hurry to get to work and simply do the best we can. For me personally, one of the most important things to keep in mind is that we are working within a Self-Help Group (SHG) framework. The key is to listen first, act second in ways that our NGOs can later carry on themselves. What we are doing is giving our skills to incredibly motivated, passionate and hard-working people who have so many odds against them, but are still able to make a powerful impact. We are helping them with their vision-not forcefully imposing our own. A few days back when we were visiting Mohanam Cultural Center, the owner Balu informed us before we entered the building that the door-frames were made low purposefully so that in bowing our heads in order to enter, we would humble our spirits. I believe that this is one of the most important aspects while we’re with our NGO-to work humbly.